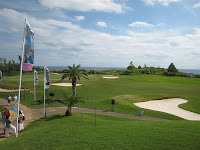 A very enjoyable afternoon at the golf yesterday took my mind of Zabeel for a few hours at least. 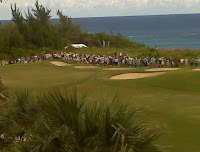 I used to yearly go and watch The Open and once went to a PGA on the outskirts of Chicago but it's one of those things that I miss, and although the crowds at Mid Ocean were not quite to that size, there were a fair number of people following the four golfers around the course. Having only four golfers - Padraig Harrington, Jim Furyk, Retief Goosen and Trevor Immelman - was strange, as that meant large parts of the course only had the sun and breeze for company whilst the entire crowd hung around the hole that the players were contesting or people bagged that altogether and waited at the '19th hole' and watched events unfold on the television as they made their way to the finish. Furyk won in a play-off against Harrington, who led by two with seven to play and by one on the final tee much to the disappointment of the bloke stood next to me wrapped in an Irish flag and with a big green hat on his red head. "I kind of treated the week like I had nothing to lose, I don't go on golf vacations , but it was a little like a golf vacation." said the American afterwards.